You need to pay on arrival the whole sum in cash and contact us 3 days before arriving confirming that you will show up for sure. Staff of the Hostel may also make notes as far as the bad or wrong behaviour is oncerned, especially with groups with young people.If you want to stay with your group in our Hostel you need to respect the desire of other guests to rest peacefully and keep the place in order as everybody else. 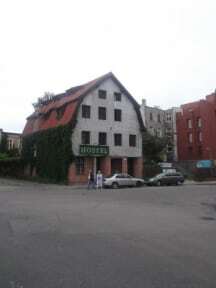 This beautiful hostel is located in a tenement house on the river in the oldest part of Gdansk. Our rooms offer direct views of the river, the Baltic Museum, Swan Dojon and St. Marys Church. We have many interesting guests from all around the world staying with us creating a really international atmosphere. The hostel is cosy and comfortable making our guests feel like at home while staying with us. As the place is not too big all tourists have a chance to get to know each other. We offer one ten bed dorm and one room for 1, 2 or three guests. We also offer parking and luggage storage. We provide free tea and coffee. There is no curfew or lockout as every guest gets their own key. We speak German & English. If you are a backpacker rest assured that we know what you need and we will do our best to make your stay as enjoyable as possible. We accept cash payment only in polish zloty, please have an exact amount of many. Thank you! Отличный хостел. Расположен в центре Гданьска. Хорошее обслуживание. Получаешь на руки ключи от входа и комнаты и гуляешь по городу до позднего времени без проблем. В общем все понравилось.